Who can imagine how this will sound: free improvised music with electric guitar, loops and soprano saxophone? Do you know that this line up (for a whole album exclusively) is a world novelty? Francesco Zago & Markus Stauss performed as NEOLITHICUM DUO in 2005. On July 28th 2006 they played their Neolithicum - Duo set as well as some free improvisations in Tradate (VA). As a special feature Markus Stauss played his soprano saxophone during the whole session instead of the bass saxophone and all has been recorded with a stereo microphone and a 2 track 24 bit flash recorder. Francesco & Markus decided to release a CD with all the improvisations plus two of the compositions under the new name ZAUSS. They produce a pre - master in Milano and Benno Hofer of Ton - Art (Basel) makes the mastering work. 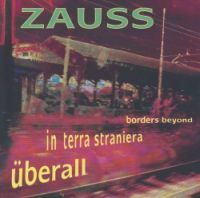 Since the CD release (November 14, 2006) ZAUSS invites (aside of playing duo concerts) guest musicians for sessiond and concerts. In the meanwhile Christian Weber (double bass) Valerio Cipollone (clarinets, soprano sax) Paolo Botta (vintage keyboards) played with ZAUSS and Markus enriched the instrumentation with his tenor sax.